Funerals and memorial services provide an opportunity for family members, friends and others who knew and loved the deceased to gather together to honor and remember the person who died while offering comfort and support to those closest to him or her, and to each other. Whether planned after death occurs (an "at-need" situation) or beforehand (a "preneed" situation), arranging a funeral or memorial service often proves an emotional, and sometimes exhausting, process. This article offers an overview of the steps you should follow to plan a funeral or memorial service, whether for yourself or for a loved one. Planning a funeral or memorial service is a highly personal process, and your decisions will be shaped by your life experiences, your relationship to the deceased, what the deceased wanted or what you desire for yourself after you die, what you can afford, and a myriad of other factors. 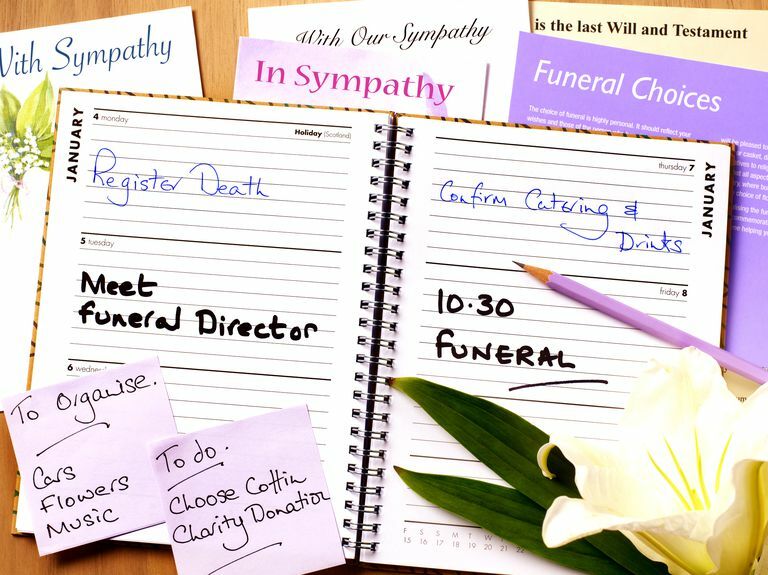 There are several reasons to plan a funeral in advance, but here are the decisions you will generally need to make. Burial (Traditional): Whether below ground in a cemetery plot/gravesite, or above ground in a mausoleum or sepulcher (sometimes referred to as "entombment"), traditional burial generally involves purchasing a casket, a cemetery plot or mausoleum space, a grave liner or burial vault, and a headstone, grave marker, monument or plaque. Burial (Natural or "Green"): A growing number of traditional-burial cemeteries, as well as sites specifically created for this form of final disposition, now offer natural or "green burial" opportunities. In general, people who select natural burial seek to minimize their impact on the environment after death. Cremation: The cremation process uses heat/flame to reduce a body to bone fragments or "ashes." These cremated remains offer survivors various options afterward, such as keeping or scattering the remains, burial below ground in an urn, placing the inurned cremated remains in a columbarium, etc. Alkaline Hydrolysis: This form of final disposition is relatively new and might not yet be available in your area, but the alkaline hydrolysis process (sometimes called "flameless cremation") uses pressure and relatively low heat (versus cremation) to reduce a body to an inert liquid and skeletal bone fragments. In the past few decades, funeral services have grown increasingly personalized, although many people still think of the "traditional funeral" as the norm. A personalized funeral or memorial service reflects the unique life and personality of the deceased individual, as viewed by the deceased and/or his or her surviving loved ones, and regardless of the form such services take. Many families these days prefer to plan a funeral or memorial service focused on remembering the deceased as he or she was in life, a service focused on the deceased's body/remains, or a combination of both. Therefore, you should imagine and plan the funeral or memorial service that you and/or the person who died consider the most meaningful way to say goodbye—something that captures the unique qualities of the deceased; reflects his or her and/or your personal, religious or spiritual beliefs; and provides a memorable, meaningful opportunity for mourners to express their grief while comforting and supporting each other. Some families choose to conduct funeral services in a place of worship or a funeral home chapel that incorporate religious readings and music; others desire secular or non-religious services held in a public or private location; still others choose to hold a private funeral and interment for immediate family members and then a memorial service later for loved ones. Officiant(s) who will lead the service, such as a clergy member, celebrant, funeral director, etc. Personal touches, such as a memory board, memorial video, personal memorabilia, etc. Do You Want the Body Present? Another important decision you will need to make when planning a funeral service concerns the physical presence of the deceased. As noted above, burial and cremation are merely forms of final body disposition, and neither requires nor precludes funeral services with the body present. For example, you can arrange a "traditional" funeral service that includes a wake/visitation beforehand with the embalmed body in an open casket even if you desire cremation of the deceased as the form of final disposition. Likewise, some families choose to cremate the unembalmed deceased without a service beforehand but hold a memorial service afterward with or without the inurned remains present. Traditionally, people send funeral flowers or sympathy flowers as a sign of support and to express their condolences. For the past several decades, however, families have also used the phrase "In lieu of flowers..." in death notices and obituaries to suggest their preference for funeral memorial donations instead of, or in addition to, flowers. Thus, you should decide if attendees may send flowers, if you'd rather they donate to a chosen charitable organization or cause in memory of the deceased, or if either form of expression is appropriate. A cause seeking to find a cure for the illness or disease that caused your loved one's death, such as cancer, heart disease, Alzheimer's, etc. After determining the above, the next step is to research your service and provider options. If death has already occurred, you can contact a local funeral home, cremation provider or cemetery. Your chosen provider can help you arrange the funeral, memorial and/or interment service you desire; provide information about your various product and service options; explain the costs involved for merchandise, services, and other professional fees; and help you create an obituary or death notice and obtain official death certificates. You should also discuss with your provider any religious or cultural preferences that you would like honored. For example, if you desire a secular or non-religious funeral or memorial service, you might like to use the services of a funeral celebrant, which some funeral homes now have on their staffs. Many funeral homes also have experience serving families from diverse cultural backgrounds with their own funeral rites, rituals, and customs. If you are planning a funeral or memorial service in advance, you should research your product and service options of various funeral homes, cremation providers, and/or cemeteries in your area. Most businesses provide convenient product and service information online, prices, and even post their general price list (GPL). This makes it easier to compare prices and service/merchandise options available locally. The Federal Trade Commission requires providers to give customers accurate and itemized price information and disclosures about other services, whether the customer asks in person or over the phone. Finally, whether you are planning a funeral before or after a death has occurred, you have several basic rights under the FTC "Funeral Rule" that you should also review and understand. Totten trust/Payable-on-Death (POD) account at a financial institution, which specifically sets aside funds for final expenses that pass to a designated beneficiary and avoid probate. In addition, it is possible to formally arrange your services in advance with a provider and then pay in advance, whether all at once or through installments. There are many reasons why people enter into these "preneed" arrangements, including removing the burden of making difficult decisions once death occurs; to prevent financial hardship on survivors, or to spend down their assets in order to qualify for certain federal benefits. Finally, if you're planning your own funeral or memorial service in advance, you should inform your family about your end-of-life wishes to make sure they know what you want. Ideally, you should provide a written record rather than relying upon a family member's memory or keeping your plans on your computer, but even a single verbal conversation with your spouse or partner, child, sibling, or parent can prove better than nothing. If you've formally prearranged your funeral or memorial service with a provider, then you should keep those documents with your other important papers at home—and let your loved ones know of their existence and their location—so they have timely access to them when necessary. If you keep your legal documents in a safe, or offsite in a safety-deposit box, then you should ensure that your loved one(s) also know the safe's combination or can access the key.